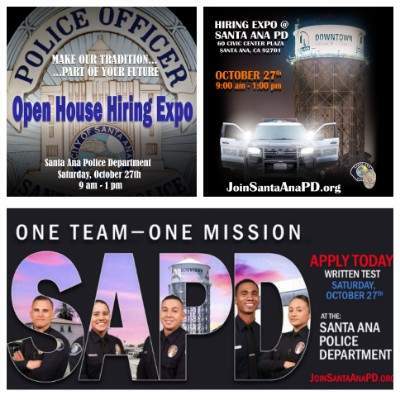 Come learn all about the many job opportunities available at the Santa Ana Police Department! Taking place this Saturday, October 27th from 9 am-1 pm in front of the Police Facility, SAPD will be holding an Open House Hiring Expo. This event allows the Community an opportunity to interact with Police Department Personnel from multiple divisions such as Communications, K9, Traffic, CSI, SWAT, Patrol, etc and learn all about the specifics of their various jobs.